The Minolta A5 was the last of Minolta's non-metered A-series rangefinder cameras. Minolta released the A5 in 1960 and the first versions were developed from the Minolta A3. The first versions were available with Citizen shutters for exposure times of 1 sec. down to 1/500 or 1/1000 sec and with either a six-element 1:2.0/45mm-Rokkor-PF or a four-element 1:2.8/45mm Rokkor-TD fixed lens. These earlier versions had cold accessory shoes, and an rotating exposure counter wheel exposed on the top cover. 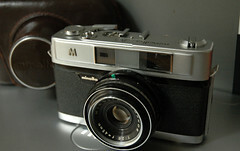 A later mid-1960's A5 was built on the Minoltina AL-s and Minolta ALS chassis, but without integral meter. This A5 featured a Seikosha shutter for exposure times of 1 sec down to 1/500 sec, a four-element 1:2.8/40mm Rokkor fixed lens and a hot accessory shoe. The latter model had it`s advance lever at the back winding out between the chromed top cover and rear door like the ALS. Just above the winder on the uncluttered top plate was the exposure counter window. This version kept the polished 'M' logo on the front, like the earlier A3 and A5's. The reliable all-mechanical A-series developed into the AL series that was continued alongside the Hi-Matic series.